With a population that is increasingly online (over 93 per cent of the Dutch used the Internet in 2015) and an array of formal mechanisms for citizens to engage in political decision-making, the Netherlands is often touted as a model for e-participation and e-government. In 2016, the Netherlands ranked 7th in the world in the UN E-Government Development Index and ranked 5th in the world in the UN E-Participation Index . While such numbers speak to the integration of digital technologies into Dutch political life, the contribution of such technologies to citizen engagement is by no means a settled matter. In fact, the political use of digital technologies is often shaped by various non-technological factors, such as the wider political context or the cultural understandings of the affordances and usefulness of technology. These were the preliminary conclusions proposed by a case study of a Dutch grassroots digital activism undertaken by Dr. Delia Dumitrica, Assistant Professor in the Media and Communication Department at Erasmus University Rotterdam. The results of this research, funded by the “Voice or Chatter? 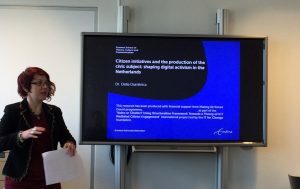 Using Structuration Framework Towards a Theory of ICT Mediated Citizen Engagement” project led by the IT for Change foundation, were presented to an academic audience in early January 2017 in a research seminar held by the Erasmus Research Centre for Media, Communication and Culture (ERMeCC).